I ordered the XS Headstress Lumberjack puzzle from Puzzle Master's wood collection months and month ago and to my shame it has sat on my shelf completely untouched for far too long! 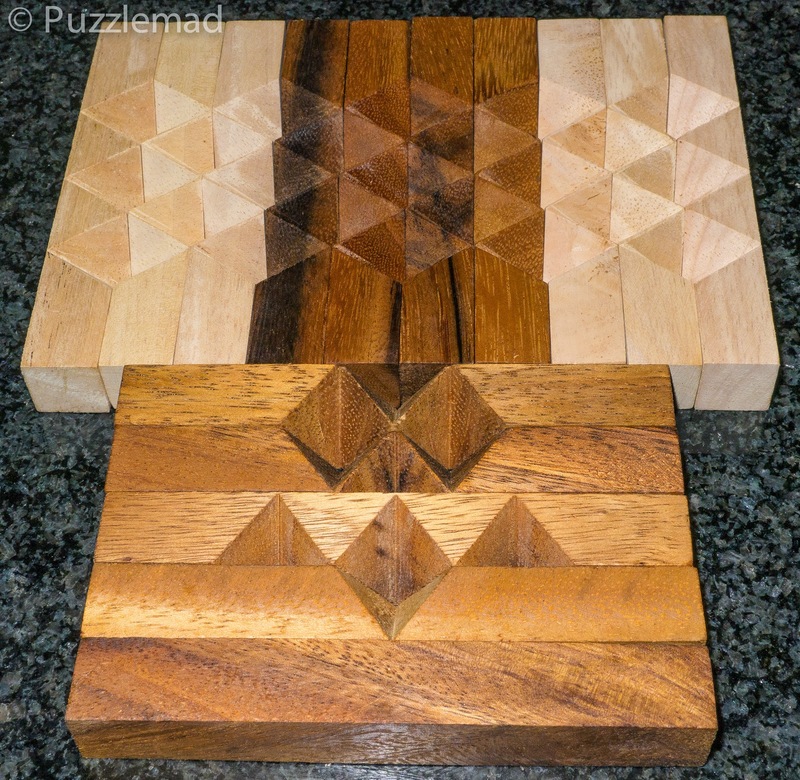 I haven't bought many wooden puzzles from Puzzle Master because I have been very spoiled by all the amazing craftsmen out there who keep me supplied with wood. For example, you can see 4 of my latest additions - luckily acquired whilst the present Mrs S was away in Scotland visiting friends and family! This meant that when the postman delivered she was not there to see that I had been buying more stuff even after my IPP splurge! But it has not been all fun and frolicking whilst she has been away - I have had quite a lot of extra work to do as well as a few chores she has left for me and also had a night on call too. Somehow when she is away, with all the extra space in the bed (she sleeps starshaped! 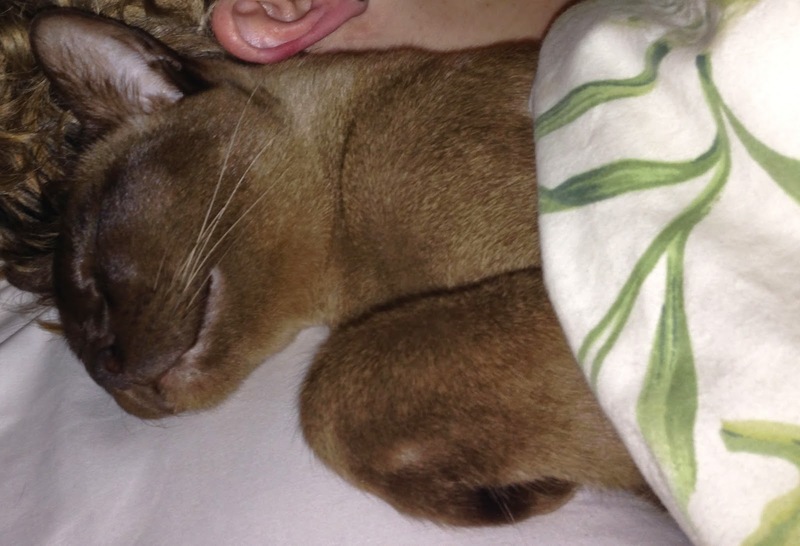 ), the cats still cuddle up with me and I STILL get left with just a 6" strip of bed and a very poor night's sleep. In fact I regularly wake up to another head on my pillow! I have managed to tidy up the study which had looked like a bomb strike and hidden the new acquisitions so she by confronted by them as soon as she gets home! 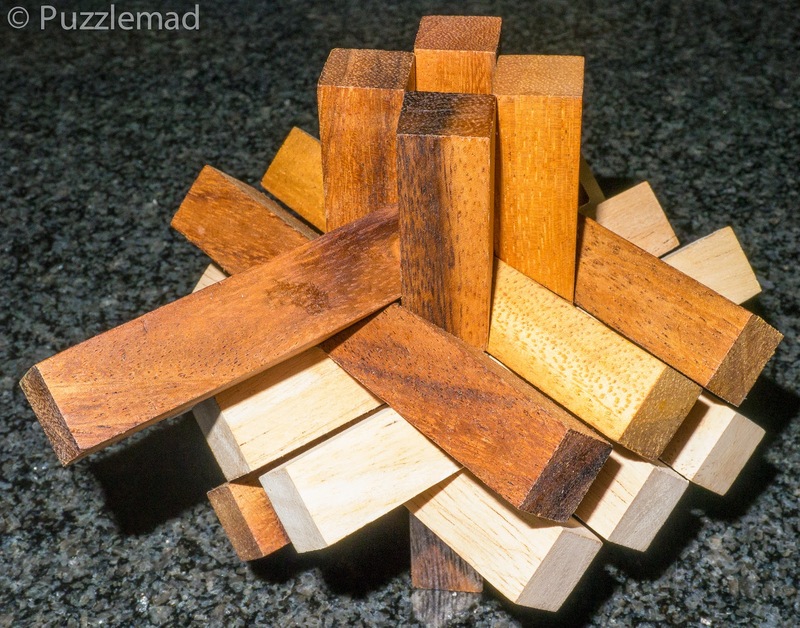 The Lumberjack puzzle is really nicely made from Monkeypod wood by Family Games of America in their IQ range and their website states that the Lumberjack has been discontinued. 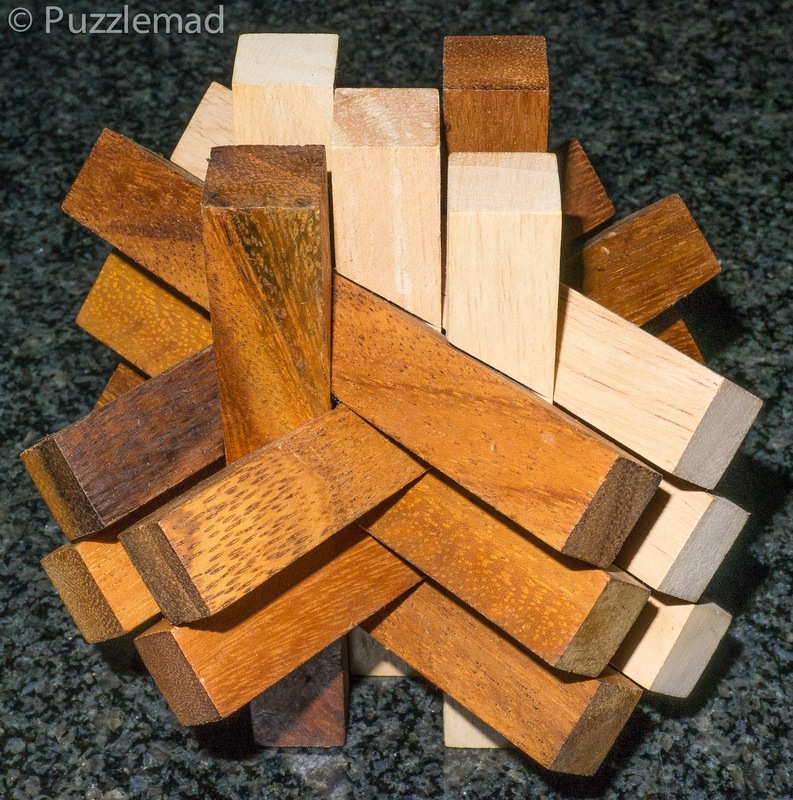 So if you are interested in this puzzle, you should probably get it sooner rather than later. It is beautifully boxed and displayed and is a rather large puzzle measuring 12.1 cm in all directions. Like many mass produced puzzles it is not as well made as those by a craftsman but this is pretty cheap at $25 and I could not expect more. It has a nice finish to the wood and the cuts have been made very accurately. 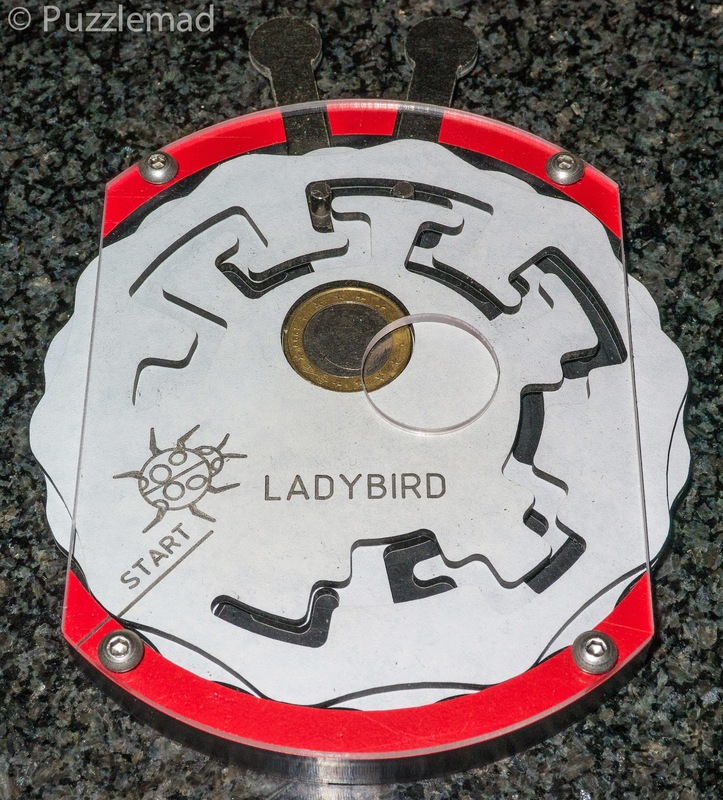 When assembled it is very stable and attractive.Puzzle Master have rated it as level 9 (Gruelling) on their scale of 5 - 10. 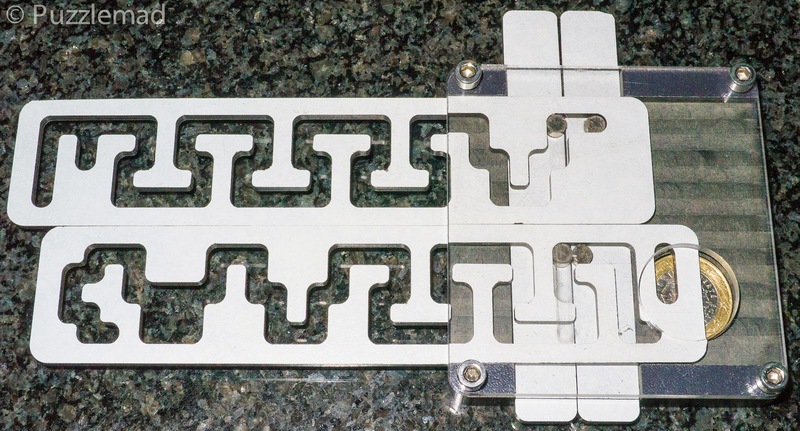 When I first requested it, I had looked at it quickly and thought it was a variant of the Altekruse type puzzles and I was very interested in obtaining one. As yet I still do not have any Altekruse puzzles in my collection. On reading the instructions on the box I realised that it was not a modular type puzzle like the Altekruse but something else entirely. No solution is provided but if you need one then you can obtain it from here. If you didn't take a photo of the puzzle then you may well kick yourself as there is no photo on the box! Otherwise head back to the Puzzle master page to see what it is supposed to look like. The photos don't tell you which type of stick goes where or the orientation of them. I had taken the first photos for the blog and did need to refer to them. After that it is a rather fun little challenge to reassemble the structure. I did have help from 2 rather curious cats who actually ran off with a piece initially and despite that it took me about 30 minutes! The reassembly is all very smooth and leaves a satisfyingly pleased feeling. This is a rather nice mass produced interlocking puzzle and a reasonable challenge for beginners or kids and will look quite nice on display. Well worth snapping one up whilst they are in stock. Michel Van Ipenburg has been liaising with Robrecht Louage and Goetz Schwandtner to make some of the recently announced IPP puzzles available. The Cross and Crown 2013 (5-ary version with 1250 moves) which was Goetz' exchange puzzle and the 7-ary version (requiring 4802 moves) which I gave him as a gift for asking me to be his exchange assistant are available individually or as a set. C&C puzzles - a really great set. 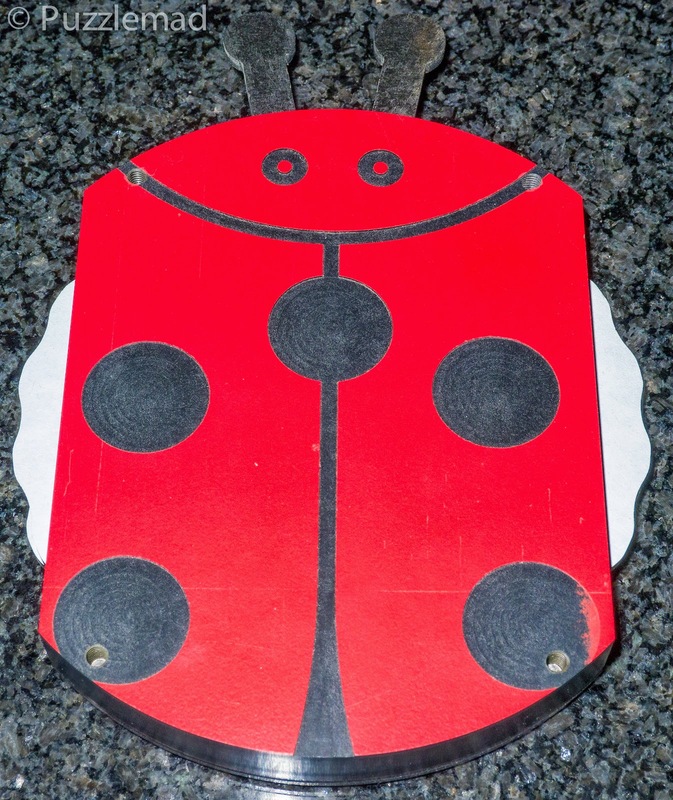 The Larva is a puzzle with a similar idea but different arrangement - I have a prototype which is the picture shown below.